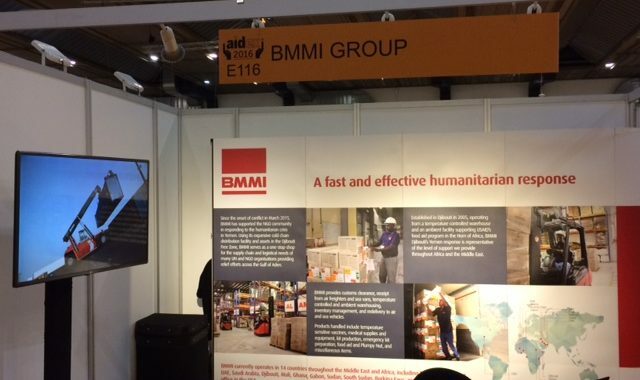 BMMI Djibouti recently took part in the AidEx Brussels exhibition to promote its humanitarian logistics. AidEx is the leading international event that is dedicated to the unique needs of development and aid professionals across the world. The two-day event is in its sixth year and is a great way to form relationships in the community, raise awareness of the organisation and get involved in sourcing new solutions to improve efficiency of aid delivery. BMMI engages with governments, the UK and NGOs using a proven partnership approach to provide a comprehensive suite of supply chain and logistical solutions in support of humanitarian emergencies, so this was a great opportunity to be put in the spotlight. BMMI Djibouti had a dedicated stand at the exhibition for the two days, where they were able to answer any questions and network when necessary.